Can you juggle? I can juggle. 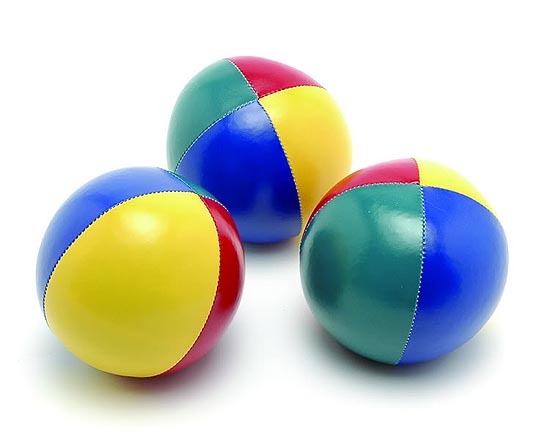 Well, I wouldn’t get a job in a circus or anything, but I can take three roughly spherical objects and do a few things with them, other than just hold them or drop them on the floor. I remember in my post-student days in flats watching folks juggling and thinking ‘that looks cool; I want to do that’. I had the same epiphany with guitar at school, though I distinctly recall thinking that it seemed to make the holder of the guitar instantly more attractive by a factor of 10 and this may have had a bearing on my decision to take up the instrument. Which I still play. But now, because I like playing it. Is this going anywhere? It is. Bear with me. One of the interesting facets of juggling, and learning to juggle, is that you must practice. A lot. And you must also learn by deliberately dropping the ball. This seems counter-intuitive, but it is all part of the process of teaching muscle memory in stages. This kind of memory is hard-earned but not easily lost. I don’t imagine for a second that muscles have memory in the same way that water does not have memory (according to homeopaths). The grooves you must fall into are ones that you make in the bit that controls the muscles, and that’s the brain, via the neurons. That’s why musicians practice scales (and why we close the doors and windows while they do so). And why we average swimmers must practice our stroke in the pool. I am the epitome of the average swimmer. I can swim 2k in the sea but it takes me over 50 minutes. Last year I did the Great Killary Fjord Swim in 51:57, and the top swimmers were coming in under 30 minutes. Try as I might I can’t get down one length of the 25 metre pool in under 20 seconds. None of which is troubling, as such, but if you are going to do something, you may as well try and do it well. And if you are planning on doing something for 3.85kms… well, you may not be fast, but you may as well be comfortable. Yesterday, in the pool, I did 1.25k workout. I am still feeling my way into the programme I have set myself, and am boning up on the jargon. For proper swimmers, a ‘long pull set’ is as obvious as telling a guitarist to play a chord of C. For me, it’s a somewhat opaque language, and you would be surprised how equally vague Google is at throwing back some lucid answers. The problem is that these phrases are such common parlance in the swim world that they appear time and time again in programmes offered online, rarely without an explanation. From what I can gather, I should have been working on my ‘pull’, which is of course what one does with one’s arms. To help focus, you can use pull buoys are any other device that keeps your legs together so you can’t kick. This increases pressure on your arms of course. Some advice suggests looping tubing around your ankles instead of using the float buoys, as these foam inventions will artificially help keep your back end up, and while this is what you want, you don’t want any help doing so in training. For some reason, when I read the rubber loop technique, I get visions of the Mafia, and ‘swimmin’ wid da fishes’ so I’m not sure I would go that route, unless I had a coach present. Or at least someone who was paying attention to pull you out if it all went horribly hatstand. You can also include paddles in this pull stroke session, and I have some, so next week, I will use them. But yesterday, I decided to focus on my kick, which often gets ignored. There are plenty of websites which will explain all about the perfect stroke, and to be honest, it’s the online equivalent of being fecked in to the deep end when you’re a kid, on the basis that you will learn to swim very quickly (or sink). There’s a lot of information out there and some sites naturally contradict others. But as I went up and down the pool and focused on my kick I found my stroke suffered. Then the breathing, then the kick faded out as my puny brain switched attention from one thing to another. In other words, I can juggle oranges, but I am still struggling with the basics of swimming. The Karate Kid is put through his paces. Maybe an option for the front crawl?